That’s held at Kew, and is from 1725. No one imitated the example of the uninhibited William Hyde of Eversholt, Bedfordshire, who condemned the dissenters in his parish in 1720 as a ‘very common ignorant and scoundrel people’. So William was quite a character. Bedfordshire Notes and Queries has this at page 209. William Hyde wrote it in the parish registers. The first is a receipt for payment for work on the church. all which Amount to forty pounds and six pence, in full for Wainscoting paving and Railing the Chancell of the said Parish of Eversholt, I say received upon the communion table of ye said chancell in full of all accounts by me. The following years till one thousand seven hundred and nine I was in trouble and maliciously persecuted by most wicked and unreasonable men who took away all my household goods wch were considerably valuable seizd upon my Benefice and make me pay the land tax viz. 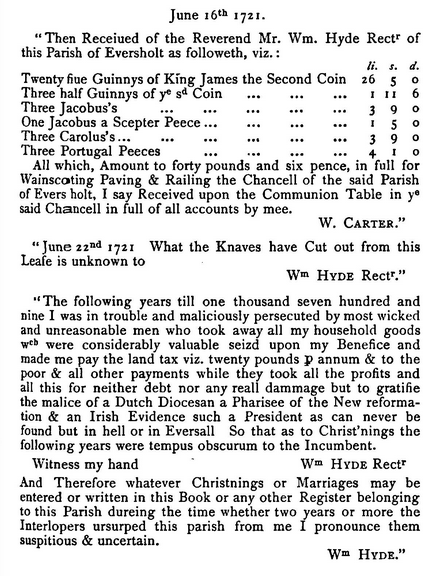 twenty pounds p annum & to the poor & all other payments while they took all the profits and all this for neither debt nor any reall damage but to gratifie the malice of a Dutch Diocesan a Pharisee of the New reformation & an Irish Evidence such a President as can never be found in hell or in Eversall. So that as to Christ’nings the following years were tempus obscurum to the Incumbent. Witness my hand Wm Hyde Rectr. And Therefore whatever Christnings or Marriages may be entered or written in this Book or any other Register belonging to this Parish dureing the time whether two years or more the Interlopers usurped this parish from me I pronounce them suspitious & uncertain. The Genealogist of 1895 (page 225) says that William’s will was proved in the court of Delegates on 1736-08-19. So it took ages to sort out his will. William was married to Elizabeth. She died 1718-08-12 and William had a very posh memorial erected to her in the church.